Sauté leeks in oil in a medium skillet over medium heat, stirring occasionally, until the leeks are soft (about 5 minutes). Add mushrooms and cook until soft (about 5 minutes). Stir in the orzo and toast lightly, stirring frequently, for about 3 minutes. Add broth and bring to a boil. 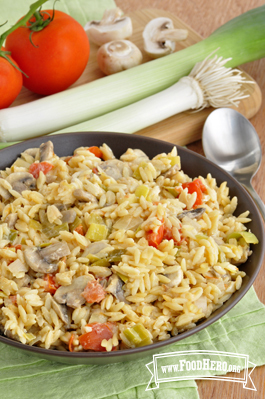 Reduce heat to simmer, stirring occasionally, until the orzo is almost tender, about 8 minutes. Add the tomatoes and simmer until orzo is tender (about 2 minutes). Remove from heat and stir in cream cheese, garlic powder, salt and pepper. Serve warm.